Can I get a confirmation of what I am including in my computation of Cash ROI? I have looked at popular spreadsheets posted by others on BP and they appear to not include any type of taxable income into the analysis. I just want to make sure that when I say I want 10% Cash ROI, I am talking about same computation to get to 10% as others. As far as I know, CoC (or Cash ROI) is always calculated as a BEFORE tax figure. Cash on Cash Return is just cash in cash out in the 1st year. Tax savings/cost have nothing to do with it. You are correct. I have the same question on the $31k. Now that I take a 20th look at this spreadsheet, it/you are just overcomplicating things. CoCR = Cash return/Cash spent in the 1st year ONLY. It's the most basic formula there is...and the one that many seem to want to butcher the most. In any event, all of this makes sense, working your ROI down to a % of money spent, if you were investing in the stock market, or if you paid for things using a "%"...such as buying a 6 pack with a "%" instead of "$'s". The bottom line is dollars, not return %. Vacancy 50$ for the entire year is a bit low. From my understanding is that one day out of the entire year ? Correct me if I'm wrong. I am assuming $31k is his downpayment. Yes, that makes sense. 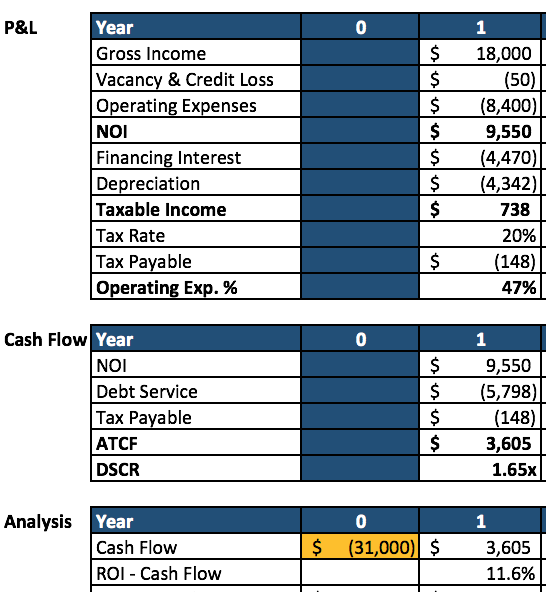 In this example, the taxable income is negligible anyway - but should NOT be included in the Cash ROI, just like it isn't (as mentioned by the OP) on any other BP calculator. You cannot include your tax burden as part of your return because as mentioned there are other considerations that will affect/determine your tax rate. What if this were your only income? Your effective tax rate would be 0. What you have to ask yourself is "What am I trying to accomplish?" If you are putting together hypotheticals to determine the suitability of an investment, you will want to use things like vacancy & capital expense, because those are possible effects on your income generation. If you are reviewing a property you already own, and it wasn't vacant during the year, it wouldn't make any sense to include an allowance for vacancy. For me, at the end of the day it is just as @Joe Villeneuve said - it is really about actual dollars in your pocket, but balanced by management of concurrent risk. I'll personally take 5% of 100k cash invested ($5k) on a non/lightly-leveraged property all day before 10% of 100k cash highly leveraged into 20 properties making 500 bucks a year each just based on a risk/reward tolerance.